You will be completely addicted with the Bopp It craze, and now it joins forces with another classic – Tetris! Providing a lot of laughs, Bopp It Tetris is a fantastic game to play with your friends or on your own. With different commands being shouted out and many different puzzles to solve you will be hooked for hours trying to complete them all. For the first time ever, Bop It! is joining forces with Tetris, one of the top gaming brands. You need to match the Tetris shapes as the challenges get faster and faster. With hundreds of puzzles and both solo and group play, this game provides endless fun! 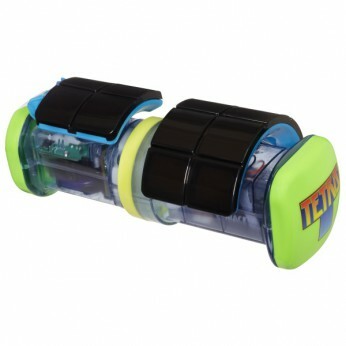 General information: For ages 8 years and over; Batteries required: 3 x AAA (included); EAN: 5010994688394. WARNING(S): Not suitable for children under 3 years old. For the first time ever, Bop It! is joining forces with one of the top gaming brands of all time, Tetris®! This all-new light game challenges you to match the iconic Tetris shapes as the challenges get faster and faster. With hundreds of puzzles and both solo and social play, Bop It! Tetris provides endless fun!Requires 3 x AA batteries (included).Take Tetris in your hands as this classic game goes from 2D to 3D with this fantastic Bop It game. Slam to start then twist the game to line up and fit together the shapes from the iconic video game. Light and sound effects will help guide you on your mission! Choose from two gameplay modes: in Marathon mode you must tackle the game on your own to see how high you can score. in Pass It mode you can challenge as many of your friends as you want to see who can stand the heat! This game is great for players aged eight and up. It comes with 3 AA demo batteries, but these may not last long. This toy costs approximately £24.99 (for the latest and best prices make sure you check our retailer list for the BOP IT TETRIS above). In our review of BOP IT TETRIS we classed it as being suitable for ages 5 years, 6 years, 7 years, 8 years but recommend you check the manufacturer specific advice before purchasing.